From an emotional and financial standpoint, perhaps no other type of claim is more disruptive than wrongful death. Physical wounds generally heal given time and treatment, but wrongful death is permanent. Unintentional injuries are the leading cause of death for people under 44. Generally, the incident involves one of the five areas discussed below. More often than not, these situations involve third-party negligence. According to some estimates, drug overdoses and other unintentional poisonings are now the leading cause of injury-related death in the United States. Generally, a long chain of events precedes a drug overdose death, and physician negligence may be present all along the way. Assume Sam breaks his leg. Dr. Smith prescribes Fentanyl or another incredibly powerful painkiller, even though something weaker would probably suffice. As a result, Sam becomes addicted to Fentanyl. Dr. Smith refuses to help Sam, even though he shows signs of addiction. Sam then goes to see Dr. Jones, who writes a prescription and does not ask too many questions. Dr. Smith may have been negligent twice, first by writing the prescription and then by refusing assistance. Dr. Jones may have been negligent for writing the second prescription when it was not medically necessary. These kinds of cases are a bit easier to win in court, because the doctor-patient duty is a very strong bond of trust. Most of these impairments involve negligence, negligence per se, or both. Alcohol is a good example. This substance slows reaction time and impairs judgement ability. If the tortfeasor (negligent driver) shows signs of alcohol consumption, such as bloodshot eyes, that may be sufficient evidence to establish liability. If the tortfeasor was arrested for DUI, liability may be easier to prove, because of the negligence per se shortcut. Falls are one of the leading causes of injury-related death for people over 65. These incidents normally cause serious head injuries, and it is difficult for most people to recover from these wounds. If the fall occurs in a nursing home or other long-term care facility, as is often the case, that facility may be legally responsible for damages. Obviously, people who take their own lives are morally responsible for the incident. But there may be a difference between moral and legal responsibility. A Rockford personal injury attorney is only concerned with the latter. For example, assume Samir demonstrates suicidal tendencies when he sees Dr. Davis, yet Dr. Davis does nothing to help Samir. In that situation, Dr. Davis may be legally responsible for a subsequent suicide. That’s especially true because of the aforementioned strong doctor-patient duty. Unintentional drowning is the leading cause of death for children under 4. Just a few moments under the water are sufficient to cause permanent brain damage and even death. Property owners are often legally responsible for these incidents. That may be true even if the pool owner displayed a “Swim At Your Own Risk” sign or if the child swam in the pool without permission. Under both common law and Illinois statute law, owners have a duty to keep their pools safe. 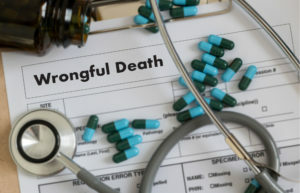 Wrongful death survivors may be entitled to significant compensation. For a free consultation with an experienced personal injury lawyer in Rockford, contact Fisk & Monteleone, Ltd. After hours visits are available.